It’s beginning to feel a lot like Christmas... and that’s because the holiday season apparently officially starts the second the last piece of Halloween candy is dumped from its plastic jack o’ lantern onto the living room floor. But you really can’t be THAT mad, ya know? Sure, it’s still t-shirt weather in SF, but it’s also the most wonderful time of the year! For two whole months, you have no excuse not to partake in every single holiday activity on this list -- all of which will get you in the holly-est, jolliest mood. We promise. And we don’t mess around with the truth when presents are on the line. The Holiday Ice Rink at Embarcadero Center is the Bay Area’s largest outdoor ice rink and is right across from the Ferry Building so you can buy presents for people after you skate. The Safeway Holiday Ice Rink has views of the Macy’s Christmas tree and all of the Union Square holiday lights. If there’s only one rink you hit up (or fall down on) this year, this is probably the one it should be. The music. The pop culture jokes. The costumes. The HATS. Beach Blanket Babylon is always a fun time, but the holiday performance takes it to the next level. Plus, you can drink while you watch (as long as you don’t go on a Sunday). ‘Tis the season for science and outdoor ice skating at the Academy of Sciences. This rink has the longest skate sessions of any in the city, so if going in circles for more than 90 minutes is your thing, then this is your rink. Explore the winding lanes of Victorian London (inside of the 120,000 square-foot Cow Palace) to see what Christmas was like according to Charles Dickens. There will be music halls, theatres, pubs (yes, there’s drinking), dance parties, plenty of shopping, and over 800 colorful characters. The Great Dickens Christmas Fair happens every weekend starting the Saturday before Thanksgiving. The Christmas tree at Pier 39 will have a nightly tree lighting show synchronized to holiday music on the top of the hour from 5 to 10pm every single night. How many times will you watch it? Experience the “Miracle” that is Christmas at P.C.H. For the second year in a row, Miracle, the Christmas pop-up bar, is taking over Pacific Cocktail Haven with an overabundance of decorations, a special holiday cocktail menu, and general merriment. Plus, Starting November 1, P.C.H. will be doing special scratchers so you can win a “Golden Ticket” that lets you and a guest skip the line. The streets around Union Square will transform into an SF-style winter wonderland for five weeks of performances and entertainment, family-friendly activities, food trucks, beer and wine gardens, craft holiday cocktails, and plenty of things to Instagram. You should stop by the Fairmont during the holidays no matter what to see the enormous two-story Gingerbread House, but while you’re there why not also experience the Gingerbread Holiday Tea service? Seatings are on the weekends through December 12 and then Thursday through Sunday until January 1. This drag send-up to The Golden Girls has “traveled down the road and back again” only to become one of SF’s best holiday traditions. The Winter Park at Civic Center is a brand new ice skating rink that also includes a 400-foot track modeled after the internationally-famed Wiener-Eistraum ice rink located in the City Hall Square of Vienna. The San Francisco Symphony will accompany this Tim Burton film about the misadventures of Jack Skellington’s time in Christmastown. It’s a whole new way to watch this cult stop-motion hit. Caroling is fun, but you don’t have an entire orchestra backing you up like you will at this “Deck the Hall” matinee performance that includes guest artists and special performances from members of Beach Blanket Babylon and more. Every year, the Wender Weis Foundation for Children takes over AT&T for “Holiday Heroes,” a party where 1,500+ attendees, including 400 underserved children, can experience a night they’ll never forget. This year guests can meet their sports heroes, like Hunter Pence, do arts and crafts, face painting, cookie decorating and more, access the batting tunnels and dugout, run the bases, and partake in a silent auction. It’s their biggest fundraiser of the year with proceeds benefiting Family House, No Kid Hungry, UCSF Benioff Children’s Hospital, and more. SF’s fiercest drag queens take over the Safeway Holiday Ice Rink for lip syncing, skating, and hijinx. Plus, you can skate with them! A.C.T. has been putting on this Christmas classic for 42 years as a way to remind everyone what the holiday season is really about. This tree lighting ceremony is a bit more intimate than the others and includes light refreshments, caroling, and a lantern-lit evening forest walk. 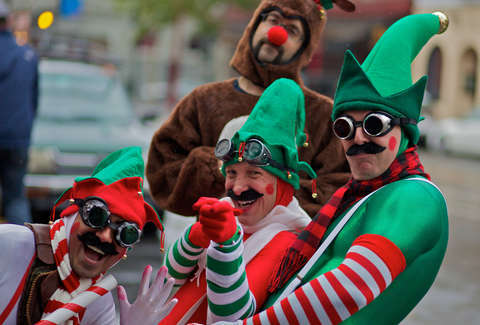 SantaCon is back for another year and is your last chance to really earn your spot on the “naughty” list. Technically, the party “starts” in Union Square between noon and 6pm (because that’s where you go to bring your toy for Toys for Tots), but basically you can just go into any participating bar and take it from there. Cost: Free unless you want to make it onto the “nice” list and bring a toy to donate. Last year they only got 764. The American premiere of Nutcracker happened in 1944 at the War Memorial Opera House and nearly 75 years later, the SF Ballet’s performance is still worth seeing every December. Are half of the plotlines in this movie ACTUALLY super creepy? Who cares. It’s still good, and maybe even better with the SF Symphony playing the score. Once a year NightLife at the Academy of Sciences hosts a merry marketplace with lots of shopping, DJs, access to most of the exhibits, cocktail, beer, and wine, and other fun surprises. From 6 to 8pm, watch the oldest and largest (and possibly only?) lighted boat parade on the San Francisco Bay. The parade starts at Pier 39 and goes west past Fisherman’s Wharf, Fort Mason, and the St. Francis Yacht Club. If a family left Kevin behind alone in 2018, they’d get arrested, but 1990 was a simpler time when child negligence wasn’t as frowned upon and anyway, it’s a classic and you’ll appreciate the music so much more when hearing it live. Ring in 2019 by watching the fireworks that will be launched off of barges just south of the Ferry Building. Wake yourself up for the New Year by jumping into the Pacific Ocean (which will be hovering right around 53 degrees) precisely at noon. Okay, so it’s not the same as jumping into the ocean, but ice skating in your bathing suit is second best. Where your wildest beach attire if you want to win a prize. And since this doesn’t start until 2pm, you could actually do both. Daisy Barringer is a freelance writer who swears this will be the year she goes to the Great Dickens Fair even though she swears that every year. Follow her on Instagram @daisysf to see if she makes it.